No ornament or jewelry can match the beauty of a hearty smile. But when it hurts to smile due to an infection or cracked lips, it takes away a piece of your cheerful personality. Cracked lips in the corner of your mouth where the lips meet is commonly known as Angular Cheilitis. It is painful, obtrusive in appearance and is embarrassing. It making you feel self-conscious. It is a condition that causes the lips to swell in patches, appear bumpy and at times becomes red or even bleed especially during winter. It occurs in the angle where the lips meet, hence is termed as Angular Cheilitis. It can occur in one corner where the lips meet or both. • Swelling accompanied by the tightness of the lips. In addition, to the above the condition it causes dry corners of the mouth and dry lips. The tightness makes it painful to open the mouth, to eat or drink. There is a constant burning sensation when one eats salty or spicy foods and consumes hot beverages. This could cause you to refrain from eating causing weight loss and nutritional deprivation. Very often people sleep with their mouths open. The saliva can drool from the sides of the mouth and trap it between the pillow and the skin. Constant contact with the moist warm saliva is one of the main causes of this condition. The moisture is a perfect host for fungus, which in no time can multiply causing an infection. The fungus that grows and affects the lips is called as Candida. It is no different from the commonly known baby diaper rash. It could also lead to a bacterial infection getting into the bloodstream causing more complications than one can imagine. Get the infection examined by a doctor if you suspect an Angular Cheilitis. Some Angular infections are caused by the body itself and the cause may not be very easy to pinpoint. This type of a corner lip sore infection is termed as idiopathic Angular Cheilitis. People with the following conditions are more prone to the infection and must take extra precautions to prevent them. How is Angular Cheilitis diagnosed? The doctor will carefully examine the mouth surface, dry lip corners, and the surrounding areas to look for red bumps, swelling, cracks, soreness in the corner of the mouth or any kind of blisters. The doctor does a detailed inquiry on dietary habits, family history etc. The cause is investigated to establish if the cracked corners of the mouth are diet related or pathological. The ends of the affected area are run over with a cotton swab or a cue tip and sent to the lab for further examination to detect if it is a fungal or bacterial growth. Treatment is given accordingly. The treatment is decided based on the lab test results. In addition to creams, steroid ointments, or filler injections to reduce the folds or wrinkles around the pith region are given. Chapped corners of the mouth could lead to other complications if not treated timely. They could spread to the surrounding areas of the mouth and face. The fungal infection could spread inside the mouth leading to oral thrust. The bacteria could get into the bloodstream causing other health problems. • Avoid smoking. Smoke dries the mouth, lips, and sides of the mouth making it a perfect host for oral infections. • Rinse your mouth thoroughly after eating. Clean the sides carefully if you have folds or saggy skin around the mouth. • Licking your lips will cause irritation at the corners of the mouth. Avoid it. • Sleep well. Research has proven time and again rest is the best to heal. • Don’t scratch or peel the affected area. • Women must avoid using makeup or lipsticks for a while till they heal. Make sure the cosmetics have not expired. Discard old makeup items periodically. Wash the lip lining brushes regularly with warm shampoo to eliminate old residue. • Avoid using mouthwash excessively. A cold sore or Angular Cheilitis is not life-threatening. It usually goes away with proper treatment and care. 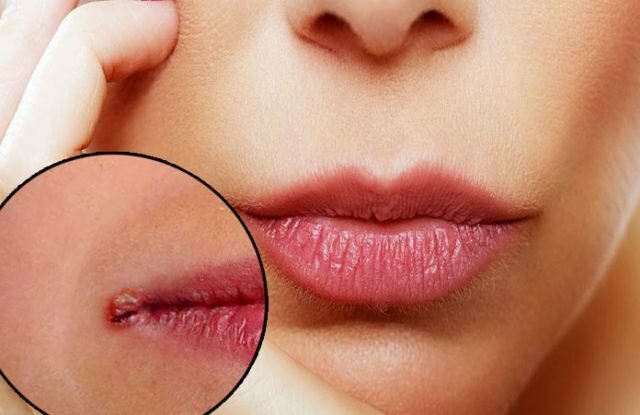 Some of the angular cheilitis home remedies suggested below are very effective and helpful in healing your split lip problem. Fungal pathogens cannot withstand very cold temperatures. Wrap a few ice cubes in a paper towel and gently press over the split lip corners for 10-15 minutes. Do not apply ice directly to the skin or you could get a cold-burn. The cold ice compress helps in reducing the inflammation and pain instantly. Repeat every few hours to get relief. Keep yourself well hydrated. Dehydration is one of the leading causes of fungal growth in the body. Dry mouth, dark yellow urine and dry and chapped lips are all indicators of dehydration. Keeping yourself well-hydrated will help fight fungal infections and flush out toxins from the body. Our saliva contains a starch called amylase which is a type of starch yeast. When you lick to moisten your lips, you may find it moist at first, but very soon the moisture evaporates. The amylase left on the lip surface makes it even drier than before. Then you continue licking. This cause extreme dryness and redness of the lips. Avoid it. If you feel like you need to lick your lips because they are dry, just drink a glass of water. A well-hydrated body will never have dry lips. Avoid peeling dry skin on your lips. Peeling can cause the dry lip to bleed resulting in an infection and stomatitis. If you notice your flaky or dry lip corners, just apply some lip balm or Vaseline for treating cracked corners of the mouth. Dead skin looks dry and flaky and gradually begins to peel. It becomes rough and dark. It is often tempting to peel away the dead skin by biting it off. Don’t do it. Instead, gently exfoliate it to reveal fresh and supple skin underneath the dead layer. There are several ways to safely exfoliate. Gently massage the lip in a circular motion with a mixture of salt and olive oil. Do it rub it. The grainy salt will exfoliate the skin and help in reducing the inflammation around the lip region. The oil will moisturize the lips. Leave it in for 5 minutes and wash with cold water to retain the moisture. This is another effective way to recover the dead skin layer and moisturize the skin. Take a clean toothbrush. Smear the bristles with petroleum jelly and gently massage the lips in a circular motion for about 3 minutes. Wash the toothbrush thoroughly with soap and an antiseptic mouthwash. Repeat it every night for a week. You will be astonished by the results. You can also do it once a week on a regular basis to maintain healthy, glossy full lips. 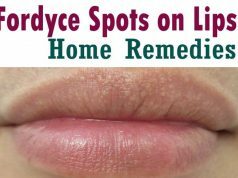 Celebrities love this remedy because lipsticks glide well on them and make the lips look wonderful. Good old honey has been used by the Egyptians for ages to help in healing dry skin and hair. There is more to it than most people know. Honey is loaded with the goodness of antimicrobial properties. Honey has the power to destroy infection-causing pathogens like candida, Albicans, and Staphylococcus Aureus that can cause Angular Cheilitis. Powerful compounds like gallic, ellagic, myricetin, ferulic acids, and caffeic acid in honey help in reducing inflammation and fighting bacterial infections. • Apply to the lips and leave it in for about 30 minutes. • Repeat twice a day for best results. You can also use this method for any bruises or cut in corner of the mouth or as an Angular Cheilitis cure. Glycerin is a natural moisturizer and one of the best overnight cure remedies. It heals dry skin by pulling moisture from the epidermis to the surface and retaining it. It is non-greasy and easy to use. No wonder many beauty skin product companies use glycerin as one of their main ingredients. To heal those chapped corners of the mouth or an Angular Cheilitis lip infection, put 2-3 drops of glycerin on a cotton ball or a cue tip and gently apply it to the lips. Leave it overnight to see best results. Olive oil the staple condiment of a Mediterranean diet is known to have great healing properties. It is packed with rich antioxidants that help fight and heal infections like Angular Cheilitis. It is a great remedy for dry skin treatment. Olive oil has also shown its effectiveness in healing, where antibiotics have failed to work. So why not give it a try? Apply warm olive oil on the infected lips and skin and gently massage for 10-15 minutes. Leave it in overnight and rinse with cold water the following morning. People with oily skin can soak for an hour and rinse with warm water, instead of leaving it in overnight as it could result in breakouts. Antibacterial mouthwash is a great way to destroy the bacterial growth causing Angular Cheilitis. Dip a cotton ball with any antibacterial mouthwash and gently apply it to the lips and areas surrounding the mouth region. Leave it in to dry. Gently pat with a wet towel to remove the residue. Apply Vaseline to the area and leave it in overnight. Repeat it once a day for a week to see promising results. The revered Indian medicinal leaf is a great remedy for dry skin infections. Neem leaves are packed with antibacterial and antifungal properties. No wonder Indians world over use neem in healing therapies. The leaves of neem are chewed with molasses to treat any internal fungal or bacterial growth infesting in the body. • Boil one cup of neem in 1 liter of water for about 10-15 minutes. • Strain it into an airtight jar. • Dip a cotton swab and gently apply over the infected skin area. 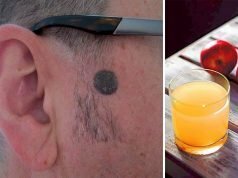 You may also combine one ounce of this juice with fresh orange or apple juice and drink every morning on an empty stomach to help heal from within. This multipurpose kitchen aid not only helps in making great fluffy cakes, pastries and bread; it also acts as a multipurpose cleaner and disinfectant. The active ingredient soda bicarbonate in baking soda is a great home remedy for a number of ailments. Baking soda is well known to destroy Streptococcus bacteria that particularly cause Angular Cheilitis. It also makes a great exfoliating agent useful in the removal of the dead skin layer. • Make a thick paste using baking soda and water. • Gently massage it over the blister on the corner of the mouth and the surrounding dry region. Leave it in for 15 minutes. • Apply olive oil or Vaseline to moisturize the region and leave it overnight. • Repeat once a day for a week. Vitamin B deficiency is one of the main causes of dry skin infections. Take a vitamin B supplement once a day to help cure the infection and keep it away. Talk to your doctor about it. He may suggest taking it in oral form or injections depending on the severity of the blood test report. Don’t deprive yourself of nutrients no matter how busy you are. Health comes first. Add a good balance of green leafy vegetables, red fruits, and vegetables, meat, poultry, dairy and eggs to your diet. Skin begins to dry out as we age. We further abuse it with excessive exposure to sun, wind, pollution in combination with vices like drinking alcohol and smoking. Water is the key to retain moisture. Keep your body well hydrated and treat your skin with love and care. Using any one or more of the above natural treatments are not only beneficial to heal dry skin infections, they can also be a part of daily skin maintenance ritual.